If you sometimes find it difficult to clean fallen leaves all over your yard then this should be the end of your struggle. This gardening in cleaning decksand walkways and you can even get rid of light snow. They make your work fast and easy as compared to using manual tools. There are different types of leaf blowers that you will find today. Just like other tools, you need to maintain your leaf blower so that you can prolong its life. The maintenance may vary depending on the type of leaf blower that you have. This article covers the different types of leaf blowers and how to maintain them. There are different types of leaf blowers and each has its pros and cons. The following are some of the common leaf blowers that you will find on the market. This type of blower is light and mainly designed for single hand use. It is started with a push button and it is a noisy machine while at work. The corded electric blower can clear debris in walkways or 100 feet garden. The corded blower can cause limitation since it has a cord and can therefore not go so far. It should be handled with care so that it cannot get tangled in trees or bushes. This kind of blower is light and so popular among the home gardeners. It has no cord and therefore can easily maneuver. The blower has got rechargeable batteries that can go about an hour while working. After the batteries have exhausted the machine will not work. Cleaning of debris using this kind of blower is easy and very fast. The blower is noisy but the best option since it used gas. The chord has to be pulled so that you start it and this is often done, they need gasoline to run and most have a two-stroke engine and some four stroke. These have a lot of power and easily clean debris in the yard or garden. They are convenient since they can be carried on the back and hence easy to carry. The backpack blowers are noisy and can also pollute the air. You need to use oil and gasoline to run this machine. This is the best blower while cleaning a huge yard or even a garden. To run and start the machine there is no need for oil or gasoline, they are mainly used for commercial cleaning of debris. Maintaining your leaf blower is important because it will boost its longevity. You want your machine to give you great performance for many years. These tips will help you maintain your leaf blower. This type of leaf blower removes debris from your backyard or garden so fast and easily. It requires routine maintenance so that the engine will run so smoothly and idle without loss of power. To turn up a leaf blower its best done before its first use in spring. This usually prevents engine problems in the future. You need to lay the Stihl leaf blower on a flat surface and let the engine cool completely if it was used earlier on. The gasoline tank should be turned left anticlockwise so that it’s loose and then pulled straight off the tank. Using some pliers pull out the black rubber fuel line with a filter at the end, on the same line press on a new filter and fuel too in the gas tank then screw the cap in a clockwise direction. On the right in a muffler on the rear side of the blower use a screwdriver and remove the spark arrestor. Brush off all the deposits of carbon on the screen and if the screen has broken wires replace it with and insert a new spark arrestor. Finally from the spark plug pull the black, rubber on top of the engine. You have to place a spark plug and turn it clockwise and put the plug boot on the new plug. These are some of the most important maintenance tips to use on the Stihl leaf blower to have it stay long and without breakdown. The first thing that should be done is to plug it out of the socket soon as you finish using it. There are delicate electronic arts that are inside the unit and if interfered with can cause a short circuit or shock. Mainly failure in a leaf blower machine is due to the cable or plug. 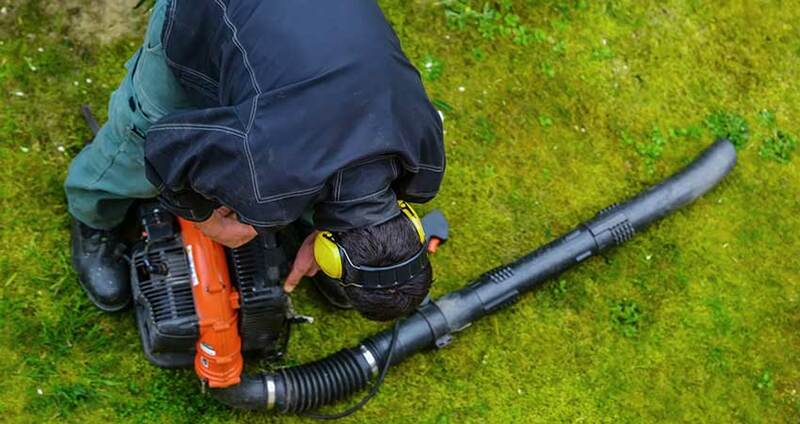 You should check any damage, tear or any irregularity before using the leaf blower. You should know basic things about electricity before repairing it or get a repairer to do it for you. Make sure that the fan is clear of any elements that might break down or stop the system. These types of leaf blowers are easy to repair as well as use. Check the entire terminal inside the leaf blower and also make sure that measure the frequency, voltage and the current using the right tools. Gas powered leaf blower are a little complicated in repairing than the electronic leaf blowers. Make sure that your eyes are well protected by wearing safety glasses whenever you are operating the gas leaf blower. Gas leaf blowers require a large amount of air or rather have a good cooling system. Most air blowers have filters that are regularly inspected so that they do not clog. To clean them tap them on a hard surface or even use a soft brush to clean the parts that are on the outer part. If filters are soaked then they need to be changed. If you have a dirty yard or garden that is full of debris then you do not need to get stressed anymore for this is catered for by the leaf blower. If you have a small piece of yard or garden or whether a huge garden all this is catered for. There is a different type of leaf blowers both electric and gas powered and come in different types either commercial or non-profit uses.